Now is the time of year that migratory breeding birds have returned from the south to nest, and each bird has a unique nesting technique. 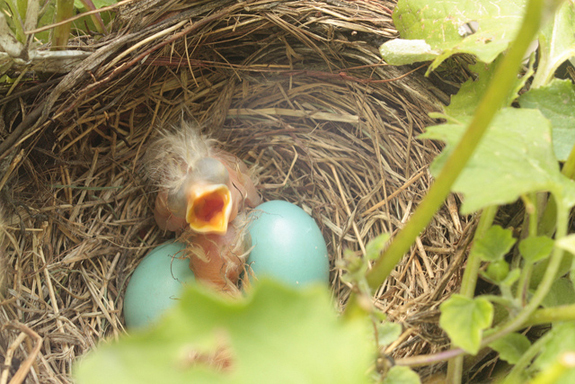 For example, robins fill their sometimes eye-level nests with bright blue eggs. Bluebirds prefer a “cavity” (i.e., a hole in a tree or box). Killdeer camouflage their nests on the ground in gravel areas near soccer fields (so keep an eye out!). 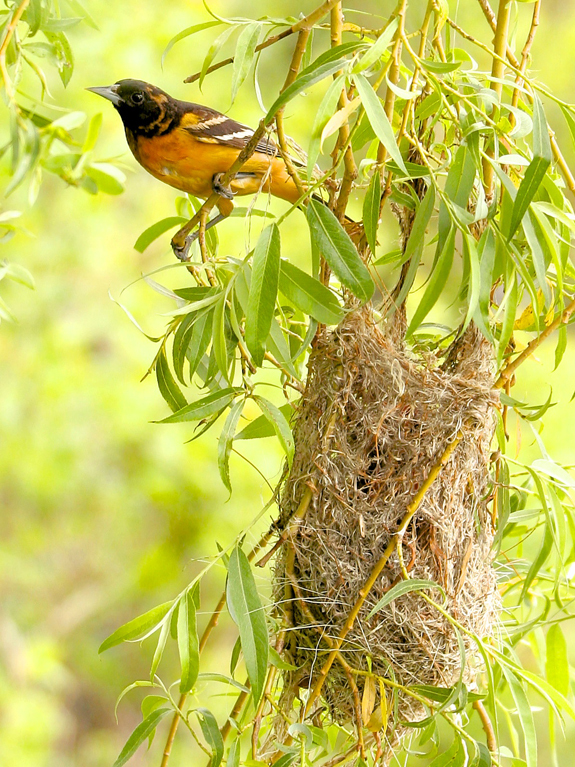 Baltimore orioles create a delicate, hanging nest that somehow manages to support several eggs at a time. Baby birds have a tough road ahead of them. They have to eat, grow, and learn how to fly while keeping an eye out for predators, including other birds and mammals. Even well meaning people can make things harder for a baby bird’s survival by prematurely intervening. 1. Hatchling. A hatchling hasn’t yet opened its eyes and may have wisps of down on its body. It’s definitely not ready to leave the nest. 2. Nestling. A nestling is older than a hatchling. Its eyes are open, and its wing feathers may look like tubes because they’ve yet to break through their protective sheaths. Nestlings are also not ready to leave the nest. 3. Fledgling. A fledgling is a young bird that is fully feathered. Its wings and tail may be short, and it may not be a great flyer, but it can walk, hop, or flutter. It has left the nest, though its parents may be nearby. Hatchlings or nestlings found out of their nest may require some help getting back into their nest. Fledglings, on the other hand, are best left to fend for themselves. For a quick go-to guide, check out Mass Audubon’s Found a Bird chart. Whatever you do, please don’t try to raise a baby bird yourself (no matter how much your own child pleads). It’s illegal to have a wild bird in your possession, and unlike the fairy tales, doing this has no happy ending.